Here’s the perfect addition to your duck Dynasty collection. This lighter features duck-patterned camouflage in color imaging, allowing two ducks and the duck Dynasty name to show through to the street Chrome Finish below. 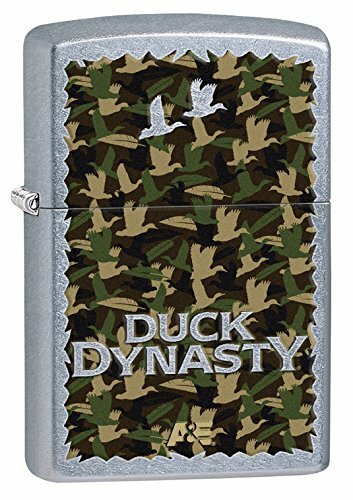 Like all zippo lighters, this duck Dynasty lighter offers a windproof design so you are never without a flame. The all metal lighter is refillable and the flints are easy to replace. This zippy lighter carries a lifetime Fix it free warranty. If this lighter ever fails you can return it to zippo manufacturing for repair. This and all other zippo windproof lighters are made in the USA. Lighter does not ship with fuel, which must be purchased separately.